Place stitch marker & join the round. Knit desired length. The longer you knit the more chunky your scarf. 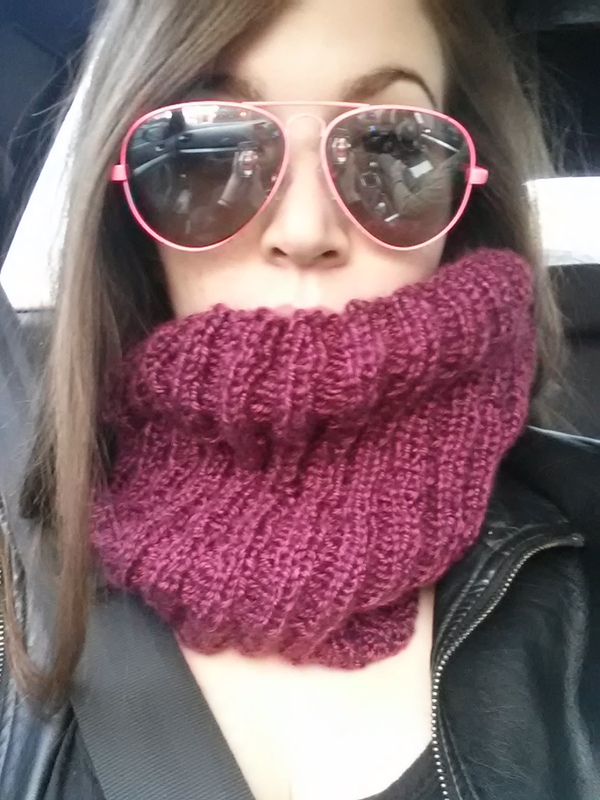 Pattern Notes: I made my project as a “cowl.” This means my scarf is just long enough to wrap around my neck twice. If you would like an infinity scarf look make sure to cast on the larger number of stitches. If you are working with different materials it is very important to check your gauge so your project comes out exactly the length you want it. I told you. Super simple! I absolutely LOVED the color of this yarn which is why I decided to use the whole skein for this beautiful project \(^_^)/ It will keep me warm all winter long! I absolutely love this creation; it keeps my face & neck warm and I like to through it over my head to use as a hood when it rains or snows! My patterns will always be free! Any contribution, however small, is greatly appreciated! Thank you so much! buy now for FREE or any amount! Posted in Knitting PatternsTagged knit pattern, knittingBookmark the permalink.